Reckon your character's strong? Make the most of it with some feats tailored to take advantage of his strength. 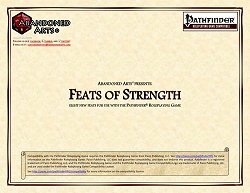 Publisher's blurb: "Feats of Strength includes eight new Strength-based feats: Break Bonds, Crushing Disarm, Gentle Giant, Headlong Charge, Master of Disaster, Sap Strength, Sucker Punch, and Smashing Blow."